The sign says "Mediterranean Cuisine" in the window of this inviting restaurant on Sunnyvale's Murphy street. Thankfully, that sign is deceptive. I prefer to think that Mediterranean food doesn't exist. Each culture that circles the Mediterranean has its own varied cuisine. As these disparate food cultures find their way to North America, they risk a loss of context, and at worst they merge into a generic abstraction. In pleasant contrast, Dishdash preserves its Arabic roots, proudly serving an artful mix of recipes from Lebanon, Jordan, Palestine and surrounding regions. The flavors from each dish compliment each other, and you can taste the soul of the food. Subtle creamy sauces warmly spiced with cinnamon, cardomon, allspice and nutmeg provide a soft foundation for fresh herbal accents like basil and mint, or the tartness of sumac, lemon or yogurt. Tender meats come marinated and charbroiled, or slow-cooked in savory sauces. A good selection of meatless dishes offers enticing options for vegetarians. Palistinian owner Emad Ibrahim comes from a restaurant family. 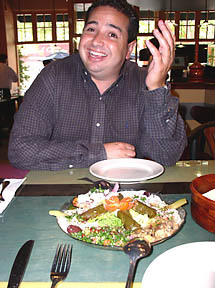 He helped start the successful Fattoush in San Fransico, currently run by his brother. Ibrahim has assembled a talented kitchen, with Iraqi chef Mohamad el Sraefi expertly balancing complex flavors with colorful presentation. When I first visited Dishdash, I was surprised to see it bustling with almost a full house on an otherwise sleepy Tuesday night. Clearly people have discovered this unique restaurant, and I soon learned why they would want to return. When we arrived, our waiter sat us at a prime table by the window. Couples also dined outdoors under umbrellas on Murphy Street's wide sidewalk. We enjoyed the amber glow of the restaurant, with its slate tile accents and colorful patchwork wooden tables. As guests explore the extensive menu, a basket of warm pita bread appears with a delightful dip of olive oil, roasted sesame and sumac. The tangy dip piques the appetite. 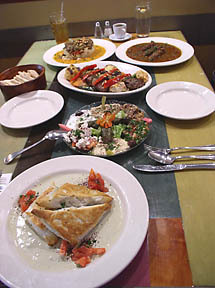 The Mediterranean maza platter ($9.95 for two) offers a convenient way to sample many of the cold appetizers on the menu. The maza platter arrives as a burst of bright colors, topped with fresh basil leaves and tomato chunks, with purple highlights from strips of fresh pickled beets and kalamata olives, four small handmade dolmas arranged in the center, a variety of cold tapenades around the side. The hummus carries a light sesame bitterness from tahini, with fresh lemon accents. Two different eggplant preparations, babaghanouge and M'nazaleh, offer smooth textures with earthy flavors, the latter with a slight crunch from walnuts. Tabouli salad, tomato and feta with chopped almonds, and yogurt with cucumber and dill add more fresh tastes. The maza platter could easily serve as a meal on its own. Lentil soup ($2.50) and an attractive selection of hot appetizers could also act as a light dinner. Standouts include Fatayer ($5.95) made from baked filo dough stuffed with spiced ground beef, on a sauce of tahini and date syrup. Dishdash's servings are large enough to order family-style, and indeed many large parties do just that. Mansaf ($13.95) is a signature dish of the restaurant, a memorable combination of rich fragrances and flavors. Tender chunks of lamb hide under a mound of saffron rice, with soft onions and fresh parsley, on a pool of aromatically spiced rich yogurt cream sauce. Each ingredient carries complimentary fragrances of different finely ground fresh spices: the lamb with allspice and cardomon in its marinade; the rice with saffron, turmeric and a hint of cinnamon, the sauce with its earthy sweet-tart buttery smoothness and myriad specs of subtle flavorings. M'sakhan ($12.95) wraps a brick-sized purse of shredded chicken and caramalized onions in thin tanour bread (resembling a flour tortilla or lavash), baked crispy brown and bathing in a tart pool of sumac and saffron yogurt. Fresh tomato chunks augment the bright flavors. The kebabs ($12.95 - $15.95) arrive on heaping oval platters of rice with grilled zucchini, cauliflower and sweet red peppers. Tender chunks of chicken, beef or lamb have been marinated in yogurt and garlic, then charbroiled on a skewer. The flavors of the meat dominate, with wood char and saltiness lingering in the mouth. Tabsi ($12.95) places kebabs of ground beef and lamb in a thick reduction sauce of caramilized onion, bell pepper, eggplant, tomato and olive oil. The tart flavors of sumac once again rise to the top in this savory blend. The vegetarian sambusak ($11.95) offsets soft textures with the light crunch of slivered almonds. A crisp crust of filo filled with spinach, mushrooms, onions, and feta cheese sits on a delicious creamy bitter-tart tahini spinach sauce. 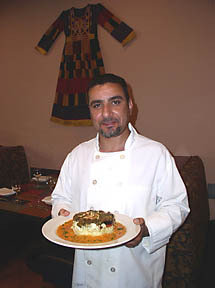 M'shakaleh ($11.95) presents a molded cylinder of saffron rice layered with eggplant, cauliflower, mushrooms and tomatoes, in a rich yogurt tomato sauce accented with parsley and a dash of cream. Dishdash offers affordable beers ($3.50) and a short mid-priced wine list to augment its delicate food. I think this cuisine has great potential for pairing with good wine, despite evolving within a culture that tends not to drink wine. The list leans toward large fruity California-style wines. I found that my glass of Joel Gott 2001 Cabernet ($8) tended to overpower the subtle nuances of saffron and allspice in my lamb dish. A better choice might surprisingly have been the Altenhofen 2001 Spatlese Reisling ($7), one of the more inspired selections by the glass. Dishdash could better flatter its aromatic cooking by adding lighter, more finessed wines to its selection. I think this food would pair beautifully with a floral Grenache-based Côtes du Rhone, or perhaps a smokey Syrah. If you survive the enormous entrees, the desserts at Dishdash ($5.95) could flatten you at last. Kenafeh comes hot from the kitchen, requiring a 15 minute wait since they make it fresh to order. A toasted pastry of crisp shredded filo soaks in sugared rosewater, sprinkled with pistachios. Inside awaits a rich filling of melted sweet farmer's cheese, almost cloyingly decadent. The rich and aromatic M'Halabieh consists of housemade pudding impregnated with rosewater, cardomon, pistachio and shaved almonds. Other desserts include assorted baklava or sorbet. I highly recommend the Turkish coffee ($2.50), which comes lightly sweetened and spiced with cardomon. This is one of my favorite ways to drink coffee, its nutty richness so close to the taste of the bean itself. Mint tea ($2.00) can offer a soothing finish, with fresh spearmint leaves steeping in a glass of either hot water or black tea. I'm pleased to find such an excellent spot for the delicate flavors of Arabic and East Mediterranean cooking. Every dish that I have tried here has delivered on its promise. The long well-conceived menu is filled with enticements, calling me back for repeat visits. The service is friendly and professional, although little tasks like water refills can take time when the room gets busy. The staff projects a sense that they enjoy their environment, which makes me feel happy to be dining here. I can easily order too much food at Dishdash, with its huge portions, rich flavors, and reasonable prices. I'll have to order less and return more often to try new dishes. I want to discover more of this subtle and warming cuisine.